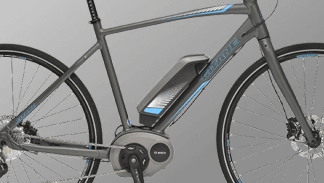 An electric bike : what is it ? An electric motor which can be located in the front or rear wheel, crank, and sometimes deported by belt. The law limits its power to 250 watts and speed up to 25 km/h. A battery which, depending on the technology used, brings an autonomy more or less important. A battery charger is provided for the power sector. An electronic controller which can regulate the different components (built into the battery pack on the picture above).